The latest insanity to explode from every media source is the "news" of a class action lawsuit alleging that Apple defrauded iOS users by releasing free software that--gasp--consumes available storage space. Plaintiffs Paul Orshan and Christopher Endara insisted in their suit that "reasonable consumers" would not expect more sophisticated software to take up more room. Specifically, they charge that 16GB iPods, iPads and iPhones sacrifice "as much as" 23 percent of their listed storage capacity on system software. Of all of the news outlets covering the story, few seemed prepared to do any journalistic digging to see if the claims would hold up to a basic sanity test. That includes ABC News, the BBC, the Latin Post, Time, The Independent UK, the International Business Times, the LA Times, CBS News and ZDNet (and that's just the first page of Google's 8.3 million search results). Particularly bizarre is the fact that within the last year, a widely published report on mobile device capacity found that Apple's iOS devices are leaders among comparable devices in using their storage capacity very efficiently Apple's iOS devices are leaders among comparable devices in using their storage capacity very efficiently . Which? noted that Apple's 16GB iPhone 5c and iPhone 5s, for example, still left between 12.6GB and 12.2GB available to the user running iOS 7. That's less than Apple's latest 16GB iPhone 6 and 6 Plus models loaded with iOS 8, which the lawsuit condemns as leaving "just" 12.7 to 13GB free. Rather than suffering a deceptive shock of missing storage, Apple has increased the free space available to users under iOS 8. This is not secret data. Why couldn't the combined efforts of the world's journalists stumble onto such facts? Further, among Android phones, only Google's anti-bloatware Nexus 5 left more than 12GB free. Sony's Xperia Z1, HTC's One Mini and LG's G2 flagship had between 10.3GB and 11.4GB free, while the most popular Android flagship of the year, Samsung's Galaxy S4, left just 8.56GB free to the user. 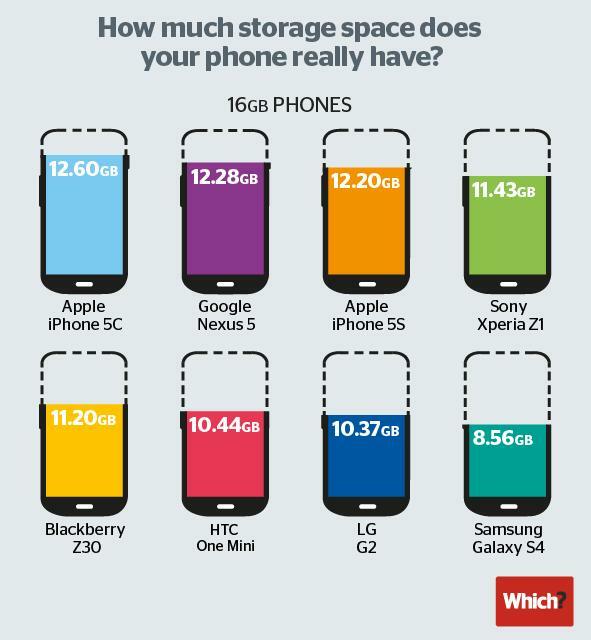 That's right: the Galaxy S4 that Samsung advertised as having "16GB" actually left users with just slightly more available space than Apple's low end 8GB iPhone. Additionally, the lawsuit in question is insisting that it is unusual and unreasonable that 16GB iOS 8 devices "only" have between 12.3GB and 13.1GB available to the user, even though that's 2 to 3GB more than most Android flagships, and around 4GB more than the most popular Samsung phone in the lineup. Blackberry's Z30 similarly left just 11.2GB free to the user. Now Android fans are probably already thinking, "well with an Android device, I can add an SD Card for more storage!" In fact, that's what Samsung itself recommended Galaxy S4 users do in early 2013 to make up for the fact that Android and bundled apps were wasting nearly half the available advertised storage. However, SD Cards don't work like built-in storage; they're more like a floppy drive. They offer no security because they use Microsoft's FAT file system, which does not support file or user permissions, enabling any rogue app to read and steal personal data and making it far more difficult for end users or enterprises to secure their devices. SD Card's lack of file and user account security--along with the related problems of potentially removable storage in a mobile device (there are many)--prompted Apple to never rely upon SD Cards for memory expansion on its iPods and iOS devices, even though it did make it possible to use external SD Cards with iPods, Macs and iOS devices via USB. Google initially supported internal SD Card slots to help make Android devices cheaper, but the security and usability issues finally prompted Google to remove SD Card support in its 2013 release of Android 4.4 KitKat. After installing KitKat, Android users found that their SD Cards no longer work, or can only be used in very specific ways, not as general purpose storage for things like apps and the user's photo library. Users who bought a Galaxy S4 and took Samsung's advice to make up for lost storage via SD Cards were subsequently left SD-out of luck. Remember, this isn't about Google issuing an update that retroactively erased a primary marketing bullet point of Android; this is a lawsuit claiming that Apple was defrauding customers by giving them significantly more free storage compared to Samsung. Not one of the reports linked above even mentioned that fact. Twenty years ago, Microsoft established a reputation for wasting space on PCs with its disk-hogging Windows software and OEM policies that encouraged unbridled third party bloatware. Apple made light of that fact in its "Get a Mac" ads, which poked at the space lost by Windows bloatware and the antivirus software required to prevent PCs from self destructing. When Apple took computing mobile with iOS starting in 2007, it made a series of engineering design choices that further limited the amount of space that system apps and the OS itself consumed (in addition to developing device storage policies that got it right from the start, rather than offering a cheaply tantalizing solution and then killing it for being poorly thought out). Google's sloppy Android OS turned back the technology clock on mobile devices, reintroducing many of the mistakes Microsoft had made in the 1990s. That's why Android is a unmitigated security disaster and why Android devices waste so much storage, even if nobody is actually suing any of those who profited from those bad decisions. However, it's not just Google that had attempted to keep the world's users stuck in the storage bloated, insecure world of poorly thought out PC engineering. Microsoft's response to the iPad, launched in 2012 under the Surface brand, similarly shoehorned bloated 1990s PC ideas into an iPad-like form factor. The result: Windows and bundled software consumed as much as 64 percent of available storage on the device, leaving just 36 percent for the user. 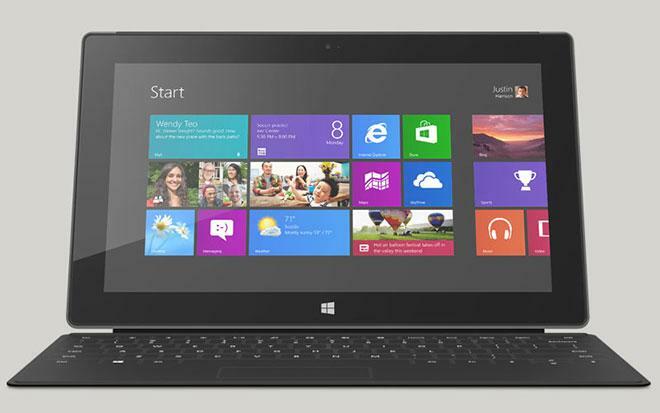 A Surface Pro with 64GB of advertised storage only leaves users with 23GB of storage. That wasn't an accidental oversight, as Microsoft warned users on its website that "System software uses significant storage space. Available storage is subject to change based on system software updates and apps usage." Again, while the suit in question says Apple's 16GB iPad takes up an unreasonable amount of its storage with 78.7 percent of its storage free, Microsoft's "64GB" Surface Pro left only 36 percent free, or less than twice as much space as the entry level 16GB iPad, despite being advertised as having 4 times as much storage.That's worse than Android and Samsung. Bravo, Microsoft.